All photo and arrangement rights © to the owner/artist, reproduction of works not permitted without attribution. Bunjin (above) by (then) Associate Professor Hirokazu Yokohigashi our visiting master for the 40th Anniversary Celebration for April 2014. The views expressed here are that of the local members, and may not reflect the official position of the Ohara School Headquarters. 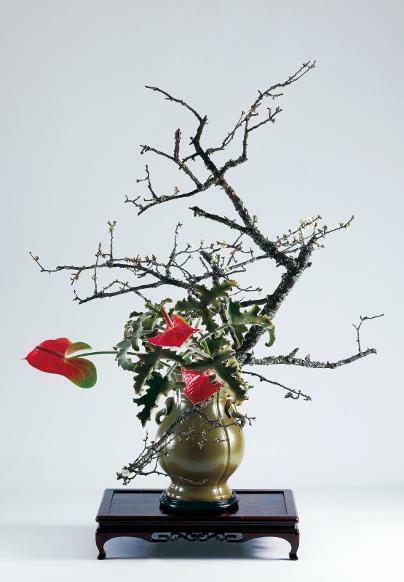 For more information about the Ohara School of Ikebana please see HQ's official website. It is my honor to serve as fifth President of the Ohara School of Ikebana's Toronto Chapter. 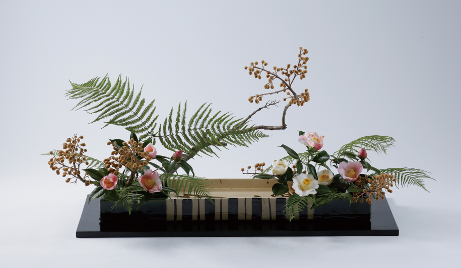 Since the inception of the chapter in May 1974, members and volunteers have worked tirelessly to promote and expand interests in the art of Ikebana through our Ohara curriculum in the Greater Toronto Area (GTA). Our mission for the 2018-2020 term is to create a learning environment with opportunities to upgrade all our members and grow our membership by promoting our chapter to organizations across the GTA. We will ensure that members have opportunities to participate in local events to grow their experience and promote the chapter. (Above) Rimpa by (then) Associate Professor Hirokazu Yokohigashi.